I make pies every year for Thanksgiving and Christmas. Always the Chocolate Silk Pie from The Mystic Seaport Cookbook, by Lillian Langseth-Christensen, which is stunningly good. (See recipe at the bottom of this post). And always a pecan pie. I’ve tried various recipes over the years, including chocolate versions. Most have been good, but not sublime. 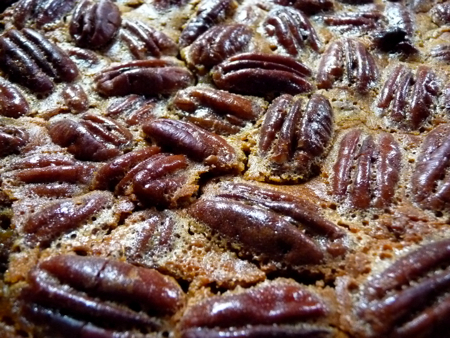 This week’s Tuesdays With Dorie recipe is a combination of pumpkin and pecan pies, with a layer of pumpkin topped by a layer of pecan. I made my own crust. I swear I did. It came together beautifully in the food processor and rolled out like a dream. (And I really hate rolling out dough.) My latest crisis is that my oven died. (Well, to be technically correct, the bulb in the oven light cracked, and when we attempted to remove it, it shattered. So we can’t get the base out, and we decided the safest thing was just to unplug the damn thing. So now I have to light the burners with a match, and the oven is verboten. So I made this beautiful crust, and then I put it in this little counter-top convection oven I got through Freecycle. I tested the oven first, making mini-versions of Dorie’s Favorite Pecan Pie (best pie on the planet, and my new go-to pecan pie recipe) and a test version of the rolls I was going to bake for Thanksgiving. Both worked fine. But the full-size pie crust — complete with aluminum foil and pie weights — was a complete disaster. It melted and shrank down in the plate, and I had to toss the whole thing. So this beautiful Thanksgiving Twofer Pie is nestled snugly in a store-bought frozen crust. Mea culpa. So while Husband went to the store for the crust, I mixed the pumpkin half and the pecan half. Easy as pie, as they say. Then we carted everything next door to my very obliging neighbor’s house, where I assembled the pie and stuck it in her oven. I gave it 10 minutes at 450 (although I have no idea whether the oven was even close to accurate; it’s in a rental apartment and doesn’t get much use) and then 45 at 350. The knife came out clean, but I was dubious: I can never tell when pies are done; it’s the bane of my holiday baking life. Husband: I actually prefer it to straight pumpkin pie, because I think the pecans add a nice meaty kind of flavor, but it’s not great overall. #1 Son: I did not like it. 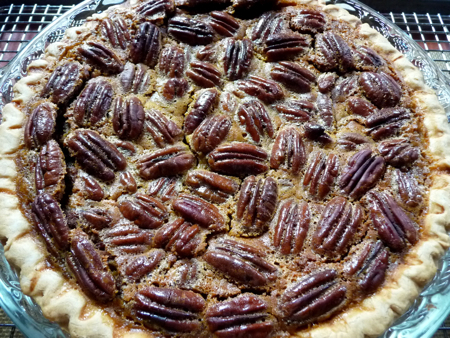 The pecans were sort of a nonentity; there was a certain sweetness to them in the pie, but they didn’t really add anything. It felt very typical. For me, not a win. Additionally, it kind of looked like baby food in a pie crust, kind of brown and globby. It’s really unappealing. #2 Son: This is the first pie that you made that I really didn’t like. I couldn’t taste the pecans at all, and the pumpkin was kind of weird tasting. Husband, second day: I still didn’t like it. #1 Son: When I tried it again later, it was actually very tasty. The pecan removed the elements of pumpkin pie I didn’t like. The presentation was still awful. #2 Son: Chilled, it tastes a lot better. It could be because I haven’t eaten anything else before it. The cold pecans are really good with the cold pumpkin. Check out how the hundreds of other TWD bakers fared with the Thanksgiving Twofer at Tuesdays With Dorie, and if you want to try it yourself, Vibi over at La Casserole Carrée has the recipe (and a chance to practice your French, if you’d like, although it’s not necessary!). Happy Thanksgiving! Cream butter and sugar. Add chocolate and vanilla and mix well. Add eggs, one at a time, beating on high for 5 minutes after each. Spoon into crust and level. Chill until set. 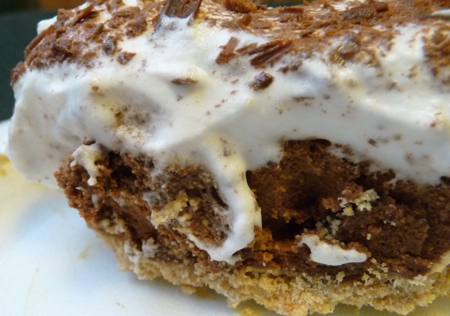 When set, top with whipped cream and shaved chocolate, making it look as pretty as you’d like. This entry was posted Saturday, November 29th, 2008 at 9:57 am	and is filed under Uncategorized. You can leave a response, or trackback from your own site. 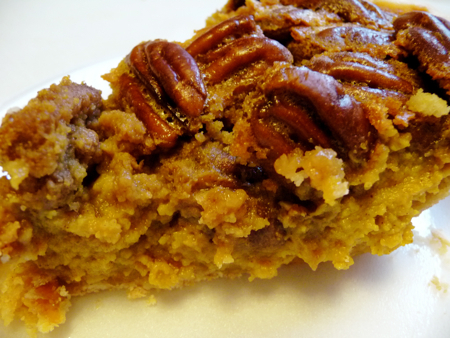 Sorry you weren’t a big fan – it seems like the pecan pie lovers were annoyed at the pumpkin part, and vice versa. People who liked both liked the pie – go figure! It looks wonderful though, and I hope you get your oven back soon. 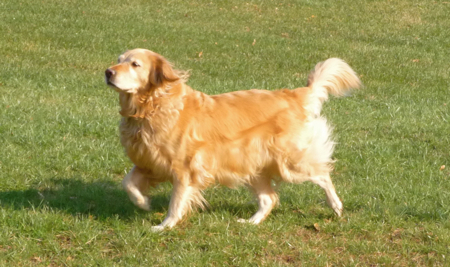 Thank you so much Lillian, for participating with me this week! I’m sorry to hear after such crust efforts, the pie had such hard reviews… nevertheless, it looks stunning! I love how you include the whole family’s comments. Sorry the pie wasn’t a hit, but at least it was better cold! It’s too bad the pie didn’t live up to expectations for your family. We still have some of it left at my house, not because we didn’t like it but because there are only 2 of us and I made 4 full size pies (I’m sometimes not so good with the decision making). Anyway, great job – especially after dealing with the crust set back! Oh.. sorry you didn’t like it. We enjoyed it but I am more of a pecan than pumpkin. But, sometimes the traditional pie wins out!